We’ve got answers. Take a look through our FAQs for some quick solutions. I was broken into and would like to get a security system installed ASAP. How would I get started? It can be unsettling to say the least to have your personal security compromised. We offer next-day delivery, so you can get secured immediately. Simply call us, or go to the “Shop” at the top of our website. Choose the equipment you want, and select the next-day shipping option. As long as you order by 2pm WST you can have your new security system the next morning. Is it necessary to talk to a Monitored Consultant or can I purchase the equipment online? If your comfortable selecting the equipment you need, then just click on “Shop” at the top of our website and purchase a system online, right now. Shipping is free, with standard delivery. How do I select the right equipment to secure my home or business? Start with the points of entry:Most break-ins occur through the front or back door, so secure accessible doors with sensors. Ground-floor windows may be protected by individual sensors, motion sensors, or glass break sensors, depending on the layout of your home or business. 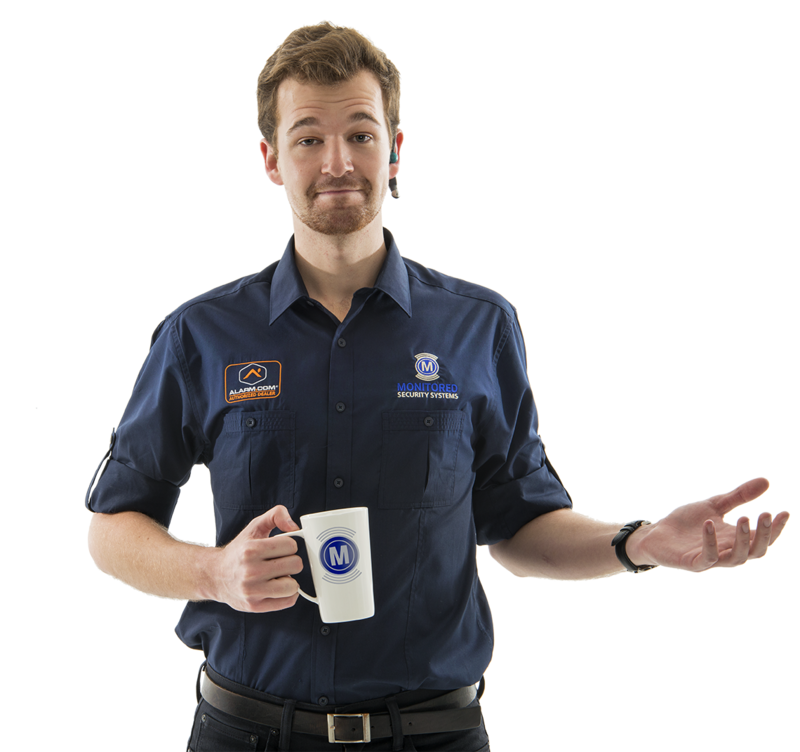 Monitored’s systems are truly customised alarms, so just call us and speak to a consultant. We’ll help you build the right security system for you. Do you provide Security Systems for renters? Yes, Monitored certainly caters to renters. since our home alarm systems don’t use wires or phone lines, they are simple to set up and even easier to remove and take with you to the next place. We won’t lock you into a long monitoring contract and we won’t charge you if you move. Do you offer security for my small business? Interactive capabilities, to let you monitor traffic at your business, inform you of employee arrival and departure times, etc. Sensors: Detection devices placed around a home or business, which alert you of trouble. Different sensors “watch out” for different things and trigger an alert if it happens. For example, some trigger if a door is opened, if glass is broken, if there’s movement in the room, or if they detect smoke. When triggered, the sensor sends, an alert signal to the Control Panel. Control Panel: The brains behind the alarm system, which manages all sensor activity and sends alerts to the Monitoring Center. The Control Panel’s used to arm and disarm the system, as well as to customize your settings. Monitoring: Every alarm system should be monitored 24/7, in order to generate the right response from the Control Panel. When alerts come in, the monitoring team contacts both you and the proper authorities, to quickly keep you home and family as safe as possible. Why do I need a monitoring service? Doesn’t the noise of an alarm scare the bad guys away? A loud siren could possible scare some burglars away. However, research shows that most burglars know they only have to gain entry and disable the Control Panel – and then they can proceed with ransacking your home. Alarms alone don’t guarantee safety. You need a security system that takes action in case of emergency – notifying both you and the proper authorities. This response is especially critical if you are away from home, or disabled. In the case of fire or other dangers (non-burglary), a noisy alarm won’t do much good at all. Yes, wireless systems really are safer! A wireless system has no requirement for a phone line, internet connection, or any other system in your house. The system will continue to function even if the landline or internet goes down. All the communication is built into the system itself. Using this built-in cellular signaling technology, a Monitored Control Panel alerts the Monitoring Center in case of trouble. This type of technology is safer than traditional wired alarm systems, because there are no wires for crim’s to cut. The wireless sensors provide a further bonus. They connect wirelessly to the Control Panel, for quick and easy installation. No drilling or complicated wiring. We’re really proud to offer a 100% wireless security solution. I don’t have good mobile reception in my area. Is that a problem for the system? The security Control Panel needs only a low-frequency signal to reach the Monitoring Center. It’s a much lower frequency than required for a voice conversation over a mobile. So chances are good that the connection will be strong, even in a low-reception area. We use several mobile networks to maximize coverage, and will confirm that there is enough signal strength in your area before completing your order. Does your wireless system work on my internet WiFi network? You don’t need a home network for our security system to work. All communication between security sensors, Control Panel and Monitoring Center is built into the equipment itself. However, to access video monitoring you do need a broadband connection. How is Monitored different from other alarm companies? Monitored Security offers 100% wireless security systems for every customer. That means our systems are not dependent on your phone line, internet connection, or any other system in your house. The sensors connect to the Control Panel wirelessly, for quick and easy installation, without drilling or complicated wiring. The built in GPRS device alerts the Monitoring Center in the event of any alarm. This type of technology is more secure than traditional wired alarm systems, because it won’t fail if your landline goes down. With no wires for thieves to cut, it’s virtually undefeatable. All of our monitoring plans protect you against burglary, fire, environmental dangers and medical emergencies, for no extra charge. All Monitored’s systems are wireless, with GPRS monitoring back to base. No installation fee. No charge to move your system to a new home. Do you see the pattern here? We hate hidden fees. You may find that the other security companies are not so upfront with their pricing. We offer an affordable solution for customers who want to view live video of their home when they’re away. Learn about your options under Cameras in our equipment section. You can view the live video feed online or from your smartphone. The system can be set up to send you a video clip if there’s any movement detected. The only charge is for the camera itself. All the monitoring apps are free. Note that video is only available with our Ultimate Plan. Are you Licensed to work in my town/state/province? 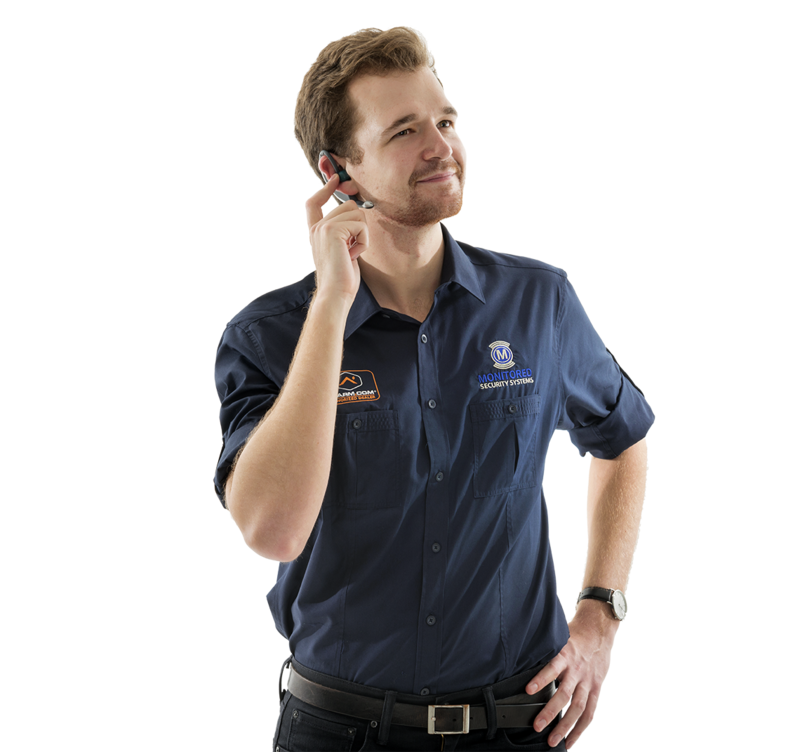 Monitored Security is licensed to work in all parts of Australia that require a license. Can I install your home alarm system myself? Absolutely. Part of what sets Monitored apart from the competition is that you don’t need a technician to get your place secured. In 30 minutes you can set up your wireless Monitored Security system, and do it in your own time. If you want any guidance, simply call our support team and we will walk you through the process. With DIY installation, how do I know if I set everything up correctly? Once you have installed your sensors and plugged in the Control Panel, just call our service department. We’ll activate your system remotely and check every sensor and make sure the system is working properly. Monitored Security won’t charge you anything to move! The Wireless system was designed to be flexible, for easy moves. Simply call our service department and we’ll walk you through the process. We can also get you instructions to make moving your system simple. It’s really easy to remove the sensors from around your house, unplug the Control Panel and you are set to go. Once in your new home, give us a call to re-activate the system and your new home is protected. No extra fee. What are Monitored’s setup or installation fees? There are NO setup or installation fees with Monitored Security. Monitored’s wireless equipment is so easy to set up you can do it yourself in 30 minutes. This simple DIY approach saves you from having to schedule a technician. It also means you won’t have holes and wires in your walls. You can easily change the location of your equipment any time you want. Even if you decide to move, or add more equipment at a later date, your monthly amount stays the same. What price advantage do i get with Monitored? All Monitored Security’s plans protect you against intrusion, fire, environmental dangers and medical emergencies, for no extra charge. All Monitored’s systems are wireless, with GPRS monitoring – Included. Delivery is free with your initial purchase. No installation fee. No charge to move your system to a new home. There’s a pattern here. We hate hidden fees. You may find that the other security companies are not so clear with their pricing. Regular shipping for your initial order is free of charge, and usually takes 2-5 business days. We can also arrange next-day delivery for a small extra fee. Can I add additional equipment later? How much does that cost? Our home security system is flexible and allows you to add new equipment at any time. You will only pay for the piece of equipment itself, as well as shipping (shipping costs apply only for additional equipment – not for delivery of your initial system). How do I select the right equipment? Start with the points of entry: most break-ins occur through the front or back door, so ensure that all accessible doors have sensors. Ground floor windows may be protected by individual sensors, motion sensors, or glass break sensors, depending on the layout. Monitored Security’s alarm systems are tailored to your requirements, so just call us and speak to a consultant. We’ll help you build the right security system for you. Yes, we offer smoke and fire detectors. If these sensors are activated, the Monitoring Center will attempt to verify an emergency before engaging the fire department. There is no extra charge for fire monitoring. If you choose a monitoring plan with interactive features, you can also be notified immediately by text or email message whenever there’s sensor activity at your house. What other protection does Monitored offer? Monitored protects your home against more than just burglary. “Life Safety” refers to emergencies of a medical or health nature. Some of our equipment includes “Panic buttons,” which you can push for immediate response to any kind of emergency. Of course we have fire protection, too, as described in the question above. All Monitored plans automatically cover you for intrusion, fire, environmental dangers and life safety – and its all included in the monthly amount. Yes. Our systems are interactive, which means you can access and control your system in a variety of ways with our monitoring plans. We find people love the online access via computer, tablet or smartphone. We also offer wireless remote that allows you to arm or disarm the system from outside the house. You can give one to each family member to ensure that they can enter or leave your home easily. The remote also includes a Panic Alarm in case of emergency. It’s the one way to stay safe! Why do you use 2GIG alarm equipment? Monitored uses 2 GIG alarm system components because they’re extremely good quality and very reliable security components.